At what point does a joke go too far? That’s a question you’ll likely ask yourself when playing Goat Simulator, a game that’s sole purpose is to be as stupid of a game as possible. Now, games purposefully designed to be bad isn’t exactly a new concept, and at times it can make for some good laughs. This is the case with Goat Simulator, a game that will at times leave you howling, but will just as often have you wondering if its unfinished nature feels like part of the joke, or if it’s genuinely bad. 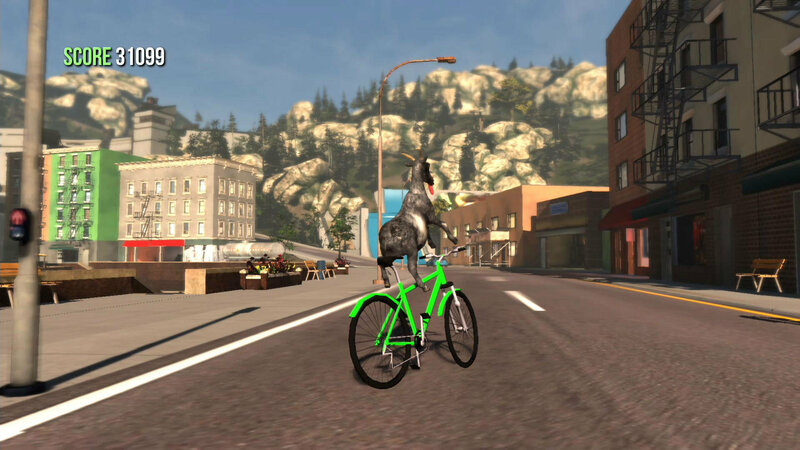 In Goat Simulator, players take control of – what else? – a goat! The goat is then thrown into sandbox environments, where the player gains points by doing… pretty much anything. Knocking stuff over, jumping over things, licking everything in sight, and just being a general nuisance will award you with points. So you basically just walk around the city messing with people. That’s it. The premise is on a bit of the “so stupid it’s brilliant” side of things, with the game rewarding you for the stupidest things possible, and the maps featuring some hilariously surreal situations (enter a water tower and you’ll find yourself in a throne room filled with fellow goats, or bring bread slices to an oversized toaster and you can transform into a flopping slice of toast!). Messing around the maps doing such stupid antics can provide some good entertainment, despite its utter pointlessness. You can even turn on some modifiers – such as jetpacks – just to add to the stupid fun. Where Goat Simulator begins to falter, however, is in its lack of polish. Developer Coffee Stain Studios purposefully left many of the game’s aspects unpolished – from graphical errors to inconsistencies in the game’s physics – all as part of Goat Simulator’s overall joke. While there is some humor to be had with seeing one of the human character’s ragdoll physics get all wonky after knocking them down, other elements – such as having the goat get stuck in place randomly, or being unable to lick an object that’s right in front of you – can get more than a little frustrating with how annoyingly frequent it becomes. It’s the technical issues like this that keep stacking up which may leave you wondering if the joke of Goat Simulator is ultimately worth it. You may get a good laugh out of the first hour or so of the experience, but after that the game may go from being a funny joke to simply feeling like an unfinished product. Sure, that’s the punchline. But like any gag, if you keep recycling it over and over it loses the humor, and just becomes stale. In a sense, Goat Simulator does accomplish what it set out to do by making a blatantly stupid experience that will likely leave a grin or two on your face. But you can’t help but wish that it could at least feel like a more fleshed-out game. The stupid charm can win you over for a while, but once that affect wears off, you’ll likely wish there were more to Goat Simulator than the joke. Just because the concept is stupid doesn’t mean the game had to be. It sounds like it is worth it for the laughs at least! I would definitely recommend giving it a try for the humor of it all (especially considering I got it for two bucks on Steam), I just wish it had some staying power. The sad thing is that we’ve seen earnest efforts that turned out worse than this game. What was their excuse? Very true. At least Goat Simulator provides some good laughs. Fully agree. I played it with a buddy for a bit and it was hysterical but I have no desire to go back and play any more of it.